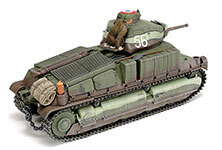 Developed from the mid-1930s as a cavalry tank, the SOMUA S35 used a number of cast metal parts to up production efficiency; the bolted cast hull design was ahead of its time. With a 47mm main gun and a 190hp V8 gasoline engine from which it could squeeze 40km/h, the SOMUA S35 was an effective package. The roughly 430 examples produced between 1936 and June 1940 proved a worthy adversary for German forces during fighting in Belgium and Northern France, their balanced performance leading many to acclaim the S35 as the best tank available to France at the commencement of WWII. 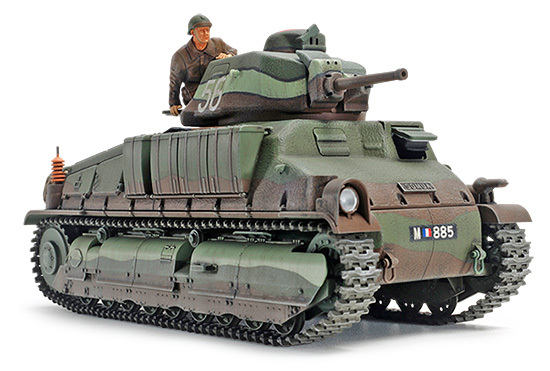 This is a 1/35 scale plastic model kit of the SOMUA S35. Length:153mm, Width: 63mm. ★Extensive measurement of a real SOMUA S35 led to this highly accurate recreation of the rounded cast metal hull and turret. ★Features realistic depictions of cast metal surfaces. 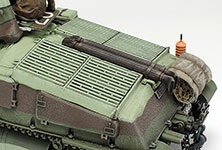 ★Intuitive parts layout efficiently captures the bogey suspension and side armor plates with aplomb. ★Link-type assembly tracks provide excellent realism. ★Comes with a commander figure to be positioned in the turret, plus 3 marking options and color camouflage pattern reference illustrations. 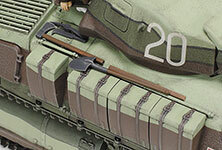 ★The curves of the cast metal turret and body are accurately captured in 1/35 scale. 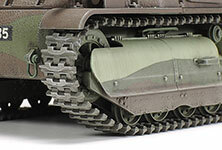 ★Take some time to appreciate the authentic recreation of the S35 bogey suspension and side armor plates. ★Link-type assembly tracks make for fuss-free assembly and great accuracy. 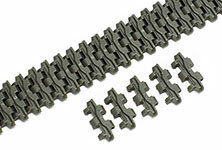 Links are pre-removed from sprue. 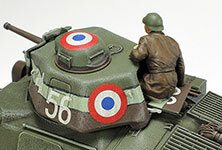 ★The kit includes a realistic commander figure surveying the scene before him, from the turret rear hatch. 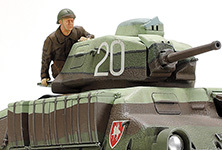 ★Your eyes will be drawn to the excellent scale reproduction of turret and cupola. 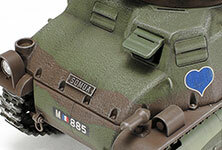 ★The recreation of cast metal surface textures - such as on the hull and turret - adds an extra layer of detail. ★The waterproof cover is created using three parts. 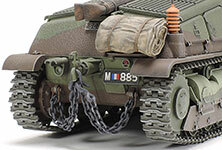 Tow chains are depicted using metal parts. ★Marvel at the precise rendering of the area surrounding the engine, including grille and exhaust pipes. ★Make sure that your model of the SOMUA S35 looks the part by attaching the variety of included accessories.